Finished a few review books I was happily inundated with recently... Two are excellent treatments, but, regrettably, another was perhaps one of publishing's greatest wastes of compressed wood pulp (maybe I'll save it for a 'worst book I read this year' posting). But on to what's good about Civil War publishing. Ironclad's No Such Army Since the Days of Julius Caesar is a definitive piece of the military history of Sherman's Carolinas Campaign. I get the feeling that most authors are so spent near a project's completion that the analysis section, which is always positioned at the end, often suffers. It feels rushed, belabored by obvious points, and spare with detail as compared with previous chapters. Not so here. The authors (Mark Smith and Wade Sokolosky) are career military officers and their critical analysis of the campaign is truly impressive. University of Kentucky Press's Contested Borderland: The Civil War in Appalachian Kentucky And Virginia is a fine introduction to the Civil War in the Big Sandy Valley and the mountain divide between eastern Kentucky and southwestern Virginia. It's coverage is broad in scope, touching on military leaders and events (both regular and irregular) as well as analyzing how social, political, religious, and economic ties factored into determining regional loyalties and support for the war. Brian McKnight's work here is the first really comprehensive examination of the Civil War in this particular region of Appalachia. I look forward to his future work. **If you're interested, my reviews of these two books will probably appear in the next issue or two of North and South magazine and will be republished later on here as well. "The Yankee Invasion of Texas"
I recently obtained a copy of The Yankee Invasion of Texas by Stephen Townsend. After posting about a couple books I admire dealing with the Overland Expedition to Texas in the Fall of 1863 (here and here), I was pleasantly surprised to find a title coming out that deals with the interrelated coastal invasion, the "Rio Grande Expedition", of the same period. I haven't had a chance to read it yet, but, at first glance, it looks like another good Texas A&M press title. When the time comes, I'll post my thoughts about it here. Donald S. Frazier. "Tom Green’s Texans: The Civil War in Southwest Louisiana". College Station: Texas A&M University Press, forthcoming. Donald S. Frazier. "Americans at War, 1861-1865: The Struggle for Southern Independence". London: University College London, forthcoming. Although I shouldn't prejudge from title alone, I'm not quite sure we need another book like the last one on the list, but the first two definitely have my deep interest. The press Texas A&M is affiliated with has had a nice run of recent Civil War titles. I hope they keep it up. Michael Burlingame: "The Inner World of Abraham Lincoln"
While viewing a CSPAN2 Booktv program last year(I wish I could remember which one), a historian mentioned that Michael Burlingame was working on a multivolume biography of Lincoln. Unfortunately, since that time I haven't seen any further mention of such a project. Michael Burlingame's The Inner World of Abraham Lincoln (University of Illinois Press, 1994) is my favorite 'Lincoln book'. It's been called a psycho-biography. This is unfortunate in some ways because the book isn't a biography in the classic sense and so many previous authors, perhaps in an attempt to make their mark in a crowded field, have vastly overreached when constructing their conclusions from the available evidence. Right or wrong, the psycho- prefix has reflexively become a bit of a pejorative term in the minds of many readers. In my opinion, Michael Burlingame's work in this regard is among the best out there. His measured approach takes neither criticism nor praise too far and he generally avoids the overreaching conclusions mentioned above that harm the credibility of so many writers (at least that's my memory of it). Inner World is a collection of excellent essays dealing in turn with AL's ambition, anger, and depression; along with his attitude toward marriage, women, parenting and slavery. My personal favorite is the very first chapter, which traces Lincoln's development from party hack to statesman. Burlingame marks the transformation in the context of a midlife crisis of sorts. I was immediately hooked as this aspect of Lincoln's political development was something I had never seen in any other scholarship--although admittedly I don't read the majority of the new Lincoln stuff that spews forth every year. On the other hand, in Inner World, some important issues were left out. One notable omission was a self-contained essay on Lincoln and religion/spirituality. Frequent scans through the upcoming and new release CW books on Amazon seems to reveal a marked uptick in Abe Lincoln 'issue books' over the past year or so. I hope readers don't confuse The Inner World of Abraham Lincoln with Tripp's The Intimate World of Abraham Lincoln. The operation was massive in scale (up to 120,000 Federals and 75,000 Confederates); and who knows if these numbers are even accurate, and, additionally, I've never seen a detailed order-of-battle anywhere. We have the interesting and unique opportunity to study Halleck as field commander; and, furthermore, all the 'big men' from the U.S. side--Pope, Grant, Buell, Thomas, Sherman--were in the field together for the only time during the war. The political, social, and military consequences of the war's first mass bloodletting at Shiloh (including the handling of Grant) could be studied to good effect at this moment. It was perhaps during this campaign more than any other that disease had the greatest influence on the condition of the opposing armies. The swampy terrain's insect denizens and lack of potable water put men in the hospital by the tens of thousands. A medical study of this campaign could probably fill a book of its own. The railroad junction at Corinth was one of the 'great points' of the Confederacy and a detailed reevaluation of the periods immediately before, during, and after the siege may provide some rich ground for a fresh strategic analysis. The lack of a signature battle or truly any significant fighting at all (the fight at Farmington won't cut it) has probably contributed to this campaign being ignored relative to the other western campaigns in 1862. It's a shame. The Battle of Bull Run is so full of drama, controversy, and interesting personages that there always seems to be room for a fresh interpretation. Professor David Detzer, whose previous Civil War book Allegiance was well received, has entered the mix with a new history of the battle that challenges many of the conclusions of prior authors. The jacket boldly proclaims that Donnybrook is the “first major history of Bull Run to detail the battle from its origins through its aftermath”. Questionable premise aside, the result is a bit of mixed bag. Donnybrook is not a classic battle study, but rather a vibrant narrative history that will appeal to a wide range of readers. Detzer’s style is informal and a bit eccentric but very effective and unfailingly entertaining. How many academic historians would describe Stonewall Jackson as a “twit” or quote boxer Mike Tyson in a chapter head? Another passage, related to Israel Richardson’s new marriage, amusingly stated that “though his loins may have been more relaxed, his fighting instinct remained”. Granted, the style isn’t for everybody, but the substance cannot be discounted. Although there is no bibliography to compare with previous works, detailed endnotes are included that make it abundantly clear that the author did his homework. Detzer uncovered a vast number of primary accounts and skillfully weaved them into the text. Even the most jaded Bull Run specialist will enjoy reading this book. In my opinion, the most interesting aspect of Donnybrook is the author’s unabashed challenging of the battle’s many myths and interpretations. There are far too many to list here but they include perhaps history’s least condemning review of Robert Patterson’s generalship (ed. 3/12/06 - Russel Beatie is similarly corrective in volume one of his Army of the Potomac series). The author’s assessment of the campaign’s heroes and villains is certainly unconventional. Detzer additionally holds the actions of Jackson and his Virginians to be unexceptional and he is never afraid to confront previous historians’s conclusions about specific events that took place during the fighting on Henry House Hill. However, the book is not without flaws, some serious. The absence of even a single map is really unacceptable. Considering how inviting most of the book is to the novice reader, how that person will begin to understand the confused fighting without maps is beyond me. Though the depiction of events up to and including the action on Matthew’s Hill is excellent, the previously smoothly flowing narrative breaks down on Henry House Hill. Mythbusting tangents and conflicting sources notwithstanding, the author fails to construct a likely sequence of events from the sources available that is comprehensive enough to give the reader a reasonable impression of what happened there. The previous works of Hennessy, Davis, and most recently Rafuse were much more successful in this regard. Finally, the ending was rushed. Though organized into three books, the action on Matthew’s Hill does not begin in earnest until Book Three and the battle’s aftermath takes up only a dozen pages or so in a book containing over 400 pages of text. This wasn’t enough space to convincingly lay out the author’s thesis minimizing the negative consequences of the Union defeat. Nevertheless, everyone interested in the Battle of Bull Run should read this book. Detzer’s narrative style is extremely entertaining, accessible, and can draw the general reader in in the vein of a Foote or a McPherson and the multitude of new interpretations of persons and events should spark a lively debate among the specialists. I was wondering when the third volume (well, actually the second, as the author did them out of chronological order) of David Detzer's trilogy detailing the first three months of the Civil War was going to be released. Looks like Dissonance : The Turbulent Days Between Fort Sumter and Bull Run will be out in May of this year. I think I take the minority view of the overall quality and level of importance of Detzer's earlier volumes, Donnybrook and Allegiance , but they are certainly worth reading. 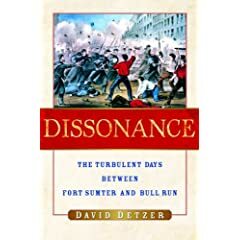 Aside from a lack of alliterative consistency with the other two titles, I found Detzer's Allegiance to be a decidedly inferior 'Fort Sumter book' to Maury Klein's excellent Days of Defiance . If nothing else, Detzer has a free swinging style and an entertaining take on the leading personalities of the period. Nevertheless, I am looking forward to reading Dissonance. At least the ground covered here is a little less trampled. 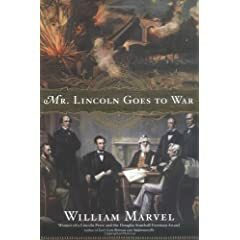 "Mr. Lincoln Goes to War"
Thanks to Brian Dirck for mentioning an upcoming Lincoln book (Mr. Lincoln Goes to War) by William Marvel in his blog. Although I have only a limited familiarity with the entire range of Marvel's work, I think it's safe to say that Dirck need not worry that Marvel's level of scholarship or depth of thought will bear any resemblence to that of DiLorenzo, Bennett, or Tripp. Even so, the book's description sounds provocative to put it mildly. "Focusing on the North's road to war in 1861, he (Marvel) argues that Abraham Lincoln made armed force a first choice, rather than a last resort, in addressing the Union's breakup. While conceding the complex problems Lincoln faced, and the corresponding limitations on his options, Marvel describes the president's course of action as "destructive and unimaginative."" It is a subject worthy of close examination (and one you won't find treated seriously in any respectable Lincoln study that I know of). I am interested in seeing the development of Marvel's argument, but I guess it will have to wait until May. Review: "Spartan Band: Burnett’s 13th Texas Cavalry in the Civil War"
In recent years, students of the Trans-Mississippi theater of the Civil War have been treated with several fine Texas unit histories. The best known of these is probably Richard Lowe’s excellent book Walker’s Texas Division, C.S.A: Greyhounds of the Trans-Mississippi. This outfit, commanded during most of its active history by John G. Walker, marched and fought all over southern Arkansas and western Louisiana from 1862 to 1865 before ending up back in Texas at war’s end. The “greyhounds” sobriquet was a result of the incredible marching distances covered by the division during the war. The 13th Texas Cavalry, organized by Mexican War veteran John H. Burnett, was one of the greyhound regiments and participated in all of the division’s major campaigns and movements. Spartan Band is a well-researched and engagingly written social and political history of the 13th Texas Cavalry regiment. In his discussion of the unit’s organization, author Thomas Reid surveys in detail the demographics of the regiment and confirms Lowe’s findings. Following assembly and training, the Texas cavalrymen were sent to Arkansas where they were promptly dismounted, forcing the men to fight on foot for the rest of the war. One very interesting subject that Reid covers is the effect of the Conscription Act on units already organized. The legislation had a profoundly negative impact on the 13th Texas, which lost over one-fourth of its strength, including many men with military experience. Up until its operations against Federal conclaves west of the Mississippi during the Vicksburg Campaign, the regiment’s service was largely confined to interminable and seemingly pointless marching and countermarching across the theater. Exhaustion and constant exposure in the wet woods and swamps of Arkansas and Louisiana took a terrible toll on the Texans’s health. Over the length of its service, disease killed almost ten times as many men in the 13th as enemy bullets did. Although one participant commented that Walker’s Texas division marched more and fought less than any other Confederate division, the Texans did see significant action at the battles of Mansfield, Pleasant Hill and Jenkins’s Ferry during the 1864 Red River Campaign. In the book, the role of the 13th Texas in these battles is portrayed adequately enough for most readers, but some may find the level of tactical detail in the maps and text to be wanting in places. Overall though, Spartan Band is a very solid regimental history that interested parties of all stripes will find well worth reading.